The newest exhibit to open at the Museum at FIT is Norell: Dean of American Fashion. Norman Norell, one of the greatest fashion designers of the mid-twentieth century, is best remembered for redefining sleek, sophisticated, American glamour. This retrospective exhibition presents approximately 100 garments, accessories, and related material chosen by designer Jeffery Banks. They are a testament to Norell’s creativity and his lasting impact on fashion. His array of menswear-inspired outerwear is my personal favorite. 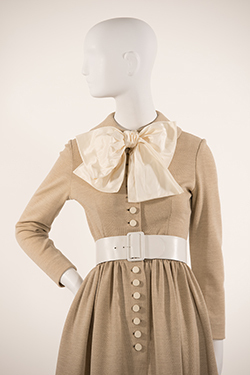 This Norell wool jersey shirtwaist with a leather belt and silk taffeta bow (1971) gives me major “prim and proper” vibes. The different textures of the belt and bow add a fun, unconventional touch to a classic look. Come check out this exhibit from February 9, 2018 – April 14, 2018. This entry was posted in Bloggers, Creating, FYI, Melinda and tagged Blogger, fashion, FIT, Melinda, Museum at FIT, NYC on February 16, 2018 by Melinda.